With the change in the season and after a week of illness my skin is in desperate need of some TLC. It won’t shock you to know that my favorite brand for skin care is The Body Shop but I have just invested in my 1st facial cleaning brush.With the winter months blowing in even my oily skin can get dry and patchy.After watching my favourite YouTubers all rave about adding a facial cleaning brush to their skincare routine I though I would have a try. 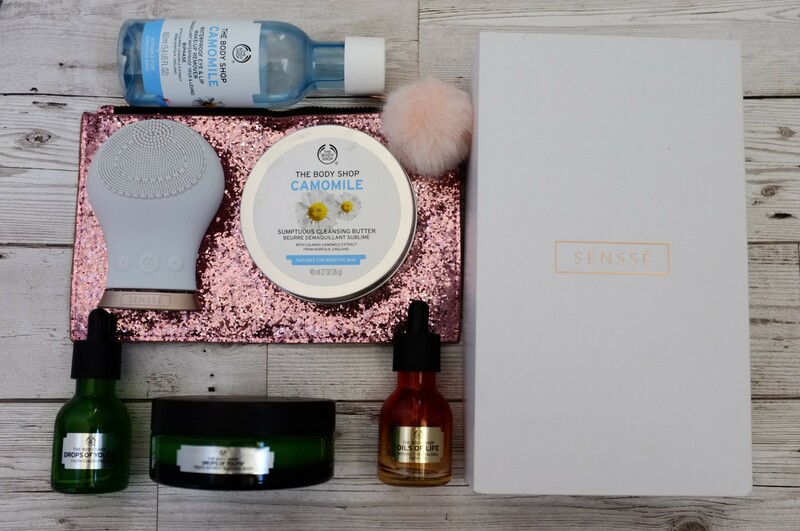 The Sensse Facial Cleansing Brush had really great reviews already and is one of the mid-range brushes on the market at £39.99. I nearly choked on my green smoothie ( aka gin drank straight from the Gordons bottle ) when I saw some brushes priced at over £150!!! .The Sensse Facial brush uses proprietary technology that delivers thousands of pulsations per minute to gently remove dirt oil, makeup residue, and dry dead skin leaving your face feeling clean and rejuvenated.By gently exfoliating off the dead skin cells a the Sensse Facial Brush will help stimulate collagen production and stop the ever-growing signs of aging. Gently move the Sensse Facial Brush around your face using circular motions being careful around the eye area. I normally do this for roughly 3 minutes. Rinse the Sensse Facial Brush underneath some warm water and store away in the cover provided with it. Apply your favorite night cream or facial oil and relax !! I have been using the Sensse Facial Brush for over a month and it’s now a firm part of my evening skincare routine. It’s small enough to pack and take away with you and can be used anywhere as it doesn’t require batteries. None of us have the time or money for expensive facials but we can steal 5 minutes a night to lock ourselves in the bathroom and look after our skin.I wanted to trial the brush for a good amount of time before reviewing it but if like me your skin could do with some extra love the Sensse Facial Brush is the product for you. If you would like to see my full evening skincare routine then take a look at the video below and all the products are listed. "TO CHARLEY-ROSE ON YOUR 2ND BIRTHDAY"